By J. P. Brooke-Little Coat of Arms no 21 January 1955. Many readers will have read in the press some account of the case of the Lord Mayor, Aldermen and Citizens of the City of Manchester versus the Manchester Palace of Varieties Ltd. It was held in the High Court of Chivalry (sitting for the first time in over 200 years) before the Earl Marshal’s Lieutenant or Surrogate in the Court, Lord Goddard, Lord Chief Justice of England, in the latter’s Court at the Royal Courts of Justice. 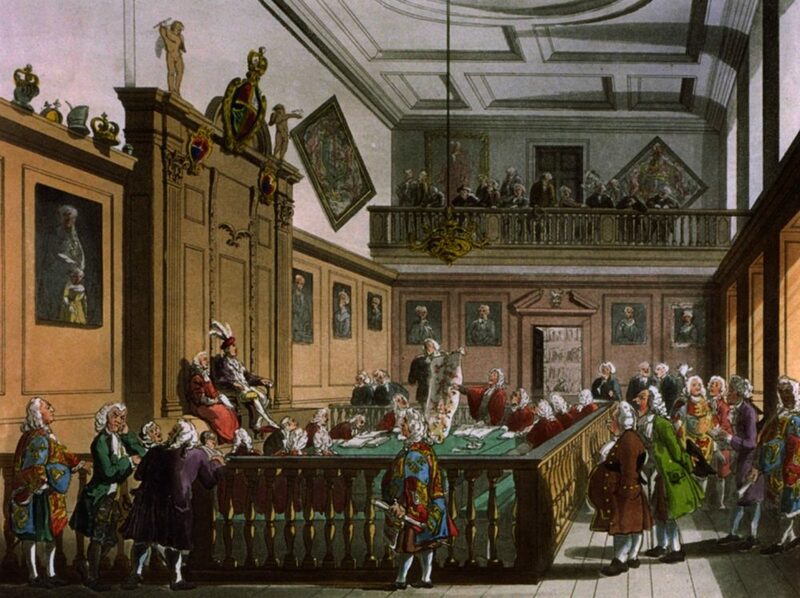 The Earl Marshal’s own Court at the College of Arms was considered to be too small. Few papers reported the case at all comprehensively and some, perhaps fortunately, did not even mention it. However I shall not attempt a full report here because, as mentioned in the Editorial, the Heraldry Society will shortly be publishing a complete account of the proceedings. I shall merely outline the argument. The fact that the Court is a civil law court was brought home sartorially by the Surrogate being attired in his robes as a Doctor of Civil Law of the University of Oxford, and by both counsel being Bachelors of Civil Law, although in their case both had robed as barristers. The Earl Marshal and the six Officers of Arms who sat on either side of the bench, were in levee dress. Mr. A. R. Wagner, Richmond Herald and one of the Joint Registers of the Court, was in academic dress and Mr. Phillips, Notary Public, the other Joint Register, wore his livery gown as Past Master of the Scriveners’ Company. The proceedings opened with the reading of various Letters Patent. From these it was made clear that the Duke of Norfolk was indeed Hereditary Earl Marshal, that he had appointed Lord Goddard his Lieutenant or Surrogate in the Court and that he (the Earl Marshal) was competent to sit without the Constable, an office which has not been held as an hereditary dignity since the execution of Stafford, Earl of Buckingham in 1521. The case itself was simple. 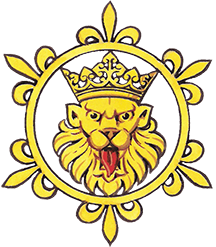 Manchester Palace of Varieties had displayed the Arms of the City of Manchester in their theatre for upwards of twenty years, and on their common seal for upwards of sixty years and denied that Manchester’s leave or licence was necessary for such display. They contended that the Court had no jurisdiction in this particular case : alternatively they contended that, by certain decisions in the Court of King’s Bench and by the House of Lords, which applied mutatis mutandis to the present case, private persons were not answerable to proceedings in the Earl Marshal’s Court for assuming to themselves to make arms, order funerals without authority or paint arms contrary to heraldry. They further contended that their display of the City’s arms was not, in the circumstances, contrary to the laws, usages or customs of arms. The plaintiffs sought the equivalent of an injunction to restrain the defendants in their uses of the City’s arms. The Surrogate seemed anxious to be sure in his mind as to whether the Court were obsolete or not. True, no Act of Parliament had ever abolished the Court, but had it been so shorn of its powers that, ipso facto, it had become obsolete? Mr. G. D. Squibb, Counsel for the Plaintiffs, submitted that the Court still had certain powers. It was certainly able to grant the injunction which his clients required and, although there was no question of its exercise in the present case, it probably still had power to fine and imprison. Anyone who did not comply with the Court’s sentence was in contempt of court and the High Court had power to issue a writ of attachment for his committal. Counsel pointed out that it would be a great injustice for the Court not to sit, as it was the only court which had jurisdiction in causes armorial. Mr. A. Colin Cole, for the Defendants, submitted that Statutes of Richard II, defining the powers of the Court of the Constable and Earl Marshal, excluded, if properly interpreted, the present case from the jurisdiction of the Court. Since (but not in consequence of) the abolition of the Hereditary Constable, the practice of the Court had been in excess of its statutory jurisdiction, and the precedents provided by the cases it had decided since then ought not to be followed. In the Statute of 13 Richard II Chapter 2 the Constable was to have cognizance of contracts touching “faitz darmes and of war out of the realm . . . and arms or war within the realm”. Mr. Cole submitted that the expression faitz darmes meant deeds of arms and had nothing to do with armorial bearings and that “arms” must be construed eiusdem generis with deeds of arms. Thus the Court could not take cognizance of the present cause which, although within the realm, did not arise out of deeds of arms or war. There was in fact no redress at law. Mr. Squibb contended that these Statutes were merely limiting statutes, designed to prevent the Constable’s Court from extending its authority to matters which more properly fell within the province of the Common Law Courts. GJ Coke had said that the Court was governed by its own usages and customs, and that it was clear that among these was jurisdiction in heraldic matters. The Surrogate said that he did not see how he could hold, against such weighty authorities as Blackstone, CJ Holt and CJ Coke that the Court had no jurisdiction in the present case. However, he did not give judgment on this question until the end of the case, but asked Counsel to deal with the merits. Mr. Cole’s final submission was that his clients used the City’s arms decoratively, and that such use did not constitute ” bearing ” the arms in the heraldic sense of that word. He said that the seal of the Palace of Varieties bore their name, and that the arms of Manchester in the centre were only an embellishment. Moreover, he argued that in Mediaeval times, it was not uncommon for men to seal with another’s seal, and quoted examples. He also submitted that, as in Russel’s Case (1692) and Donmille’s Case (1692), if there were a wrong, it was a wrong done to the office of the King of Arms (Norroy) and that, consequently, redress lay in the Divisional Court of the Queen’s Bench. The Surrogate retired before giving this judgment: ” As Surrogate to the Earl Marshal, I declare that the Court has jurisdiction in this matter. I give judgment for the agreed amount of costs (£300). The reasons for the judgment will be put into writing. I shall deliver them at an early date, and, by the permission of the Earl Marshal, I shall do so in his absence”. Most students of heraldry had no doubts in their minds that the Court of Chivalry was still extant and that if a case of misuse of armorial bearings were alleged, the Court was competent to hear it. There was, however, grave doubt as to whether the Court’s powers were now sufficient to enforce any sentence it might pronounce, and perhaps the most important consequence of this case is to remind the ignorant that there is an enforceable law of arms. The bearing of arms in England will no doubt remain controlled by custom, good manners and a sense of the fitness of things; yet it is good that those who have forgotten their manners, should be reminded that the law takes as much notice of bad heraldic manners as it does of more violent forms of discourtesy. The prevalent and regrettable philosophy that so long as something is not illegal, it cannot be unethical, has been even more confined. The arm of the law stretches far. In an unchivalrous age, a legal decision may well be an useful weapon in the hands of those who would protect their own arms, as also the ancient usages of heraldry. Although Lord Goddard has now delivered his reasoned judgment it was, unfortunately, too late to be included in this article.